Rose of Lima has a special claim on our interest for she has the honor of being the first person born in the Western Hemisphere to be canonized by the Church. Only a little more than half a century before her birth, the fabulous land of Peru had been discovered and seized for Spain by the explorer Francisco Pizarro. In 1533 this enterprising conquistador subdued the native population and took over as his capital the inland city of Cuzco, with its strange Inca temples, palaces, and great fortress. Two years later the seat of government was transferred to Lima, a city on the coast, which came to be called the “royal city of kings,” because of its architectural splendors. Dominican friars and the representatives of other religious orders were in the vanguard of a great migration from Spain and Portugal that meant a long, dangerous journey across the Atlantic, across the Isthmus of Panama, and down the western coast of South America. To implant Christianity in the new empire was a major aim; while the civilian population, European and native, were working the mines and raising products for export, the friars and priests were intensely active. 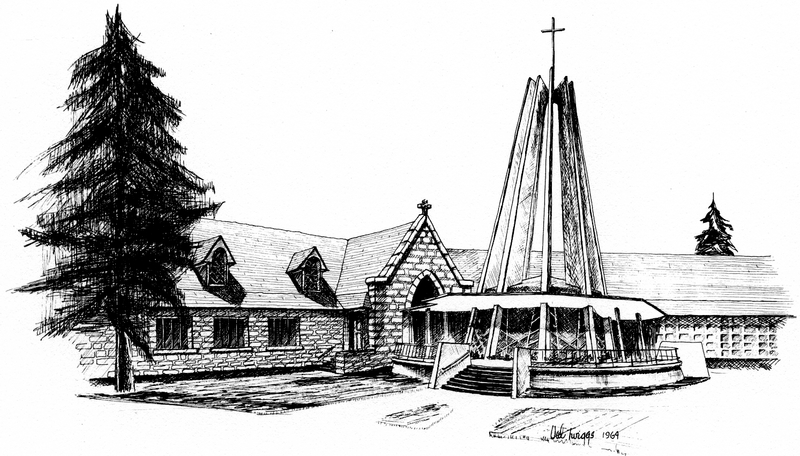 They taught, preached, learned the native languages, tried to win the love and confidence of the Indians, and soon were engaged in building churches, hospitals, and schools. 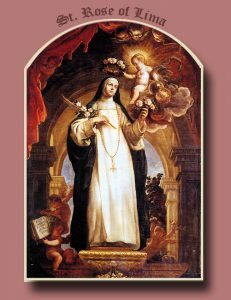 The child who became St. Rose of Lima was born on April 20 1586, of a Spaniard, Gaspar de Flores, and Maria d’Olivia, a woman who had Inca blood in her veins. The infant, one of ten children born to the couple, was baptized Isabel, after an aunt, Isabel de Herrara, who acted as godmother. This ceremony took place at home, for the baby was extremely weak. Several weeks later the tiny infant was carried to the nearby church of San Sebastian for baptism by the priest, Don Antonio Polanco. By the time she was confirmed by Archbishop Toribio of Lima, the name Isabel had been replaced by Rose, and this was the name now bestowed on her. Rose had a fresh, lovely complexion, and she was worried by the thought that this name had been given as a tribute to her beauty. So sensitive was her conscience that she had genuine scruples over bearing the name, and on one occasion, after hearing someone praise her comeliness, she rubbed pepper into her face to mar it; another time, she put lime on her hands, inducing acute suffering. This was her way-a way conditioned by the time and place-of fighting a temptation to vanity. Such self-imposed cruelties, as we have seen in the lives of some of the other saints, have not been uncommon, particularly among those of a mystical bent. Rose seems to have taken for her model St. Catherine of Siena, and, like the earlier saint, she experienced so ardent a love of God whenever she was in the presence of the Blessed Sacrament that exaltation completely filled her soul. Yet Rose was not without a practical side. Her father had been well-to-do, but when he lost money in mining ventures, the family’s fortunes reached a very low ebb. Rose helped out by selling her fine needlework; she also raised beautiful flowers and these too were taken to market. One of her brothers, Ferdinand, was sympathetic and understanding toward this sister who was so markedly “different.” As she grew to maturity, her parents were anxious to have Rose marry, and indeed there were several worthy aspirants for her hand. Rose did not wish marriage, and, to end the arguments and offers, she joined the Third Order of St. Dominic, donned the habit, and took a vow of perpetual virginity. For many years Rose lived virtually as a recluse. There was a little hut in the family garden, and this she used as an oratory. She often wore on her head a circlet of silver studded on the inside with sharp points, in memory of the Lord’s crown of thorns. Other forms of penitence which she inflicted on her body were floggings, administered three times daily, the wearing of a hair shirt, and the dragging of a heavy, wooden cross about the garden. She rubbed her lips with gall and often chewed bitter herbs to deaden the sense of taste. Both eating and sleeping were reduced to a minimum. Naturally her health was affected, but the physical disorders which resulted from this regime-stomach ailments, asthma, rheumatism, and fevers-were suffered uncomplainingly. This manner of life offended her family, who preferred their daughter to follow the more conventional and accepted ways of holiness. Finally, when Rose began to tell of visions, revelations, visitations, and voices they deplored her penitential practices more than ever. She endured their disapproval and grew in spiritual fortitude. In spite of the rigors of her ascetic life, Rose was not wholly detached from happenings around her, and her awareness of the suffering of others often led her to protest against some of the practices of the Spanish overlords. In the new world, the discovery of unbelievable mineral resources was doing little to enrich or ennoble the lives of the Peruvian natives. The gold and silver from this land of El Dorado was being shipped back to strengthen the empire and embellish the palaces and cathedrals of Old Spain, but at its source there was vice, exploitation, and corruption. The natives were oppressed and impoverished, in spite of the missionaries’ efforts to alleviate their miseries and to exercise a restraining hand on the governing class. Rose was cognizant of the evils, and spoke out against them fearlessly. Sometimes she brought sick and hungry persons into her own home that she might better care for them. For fifteen years Rose bore the disapproval and persecution of those close to her, as well as the more severe trial of desolation of soul. At length an examination by priests and physicians was indicated, and this resulted in the judgment that her experiences were indeed supernatural. Rose’s last years were passed in the home of a government official, Don Gonzalo de Massa. During an illness towards the end of her life, she was able to pray, “Lord, increase my sufferings, and with them increase Thy love in my heart.” This remarkable woman died on August 25, 1617, at the age of thirty-one. 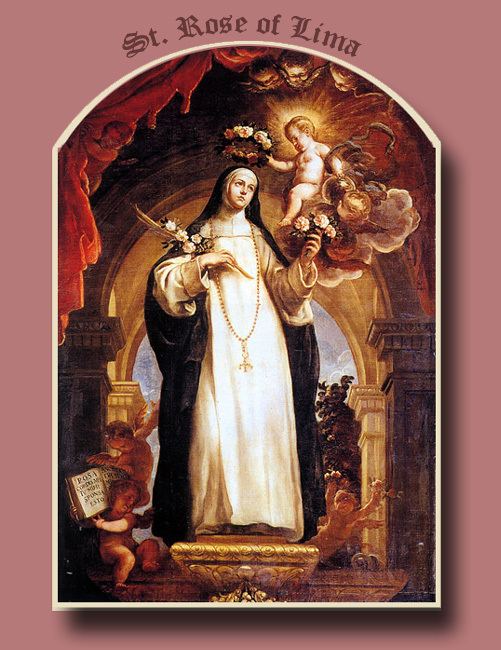 Saint Rose of Lima, Virgin. Celebration of Feast Day is August . Taken from “Lives of Saints”, Published by John J. Crawley & Co., Inc.